A cross means more than just spirituality. In the crusades, it was a martial emblem as well. This Cross of Iron Ring returns this ages-old symbol to those roots, with a design that intensifies its overall appeal. Greatly resembling the signet of a crusader or a knight, this ring depicts a Germanic cross accented with a duo of diamond-shaped nails. Set on a band of pyramidal shapes, it offers a solid and strong design that embodies the strength of those who fight. 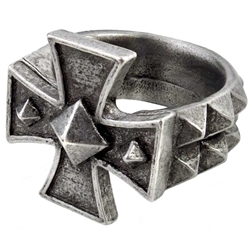 The dark pewter metal tones only enhance its appearance, making this Cross of Iron Ring a solid choice for any medieval man or woman to own and wear.